Make cake mix using package directions plus the addition of 1 egg. Fold drained orange sections into the cake batter. Bake in 2 greased and floured 9 inch pans according to directions on cake mix. 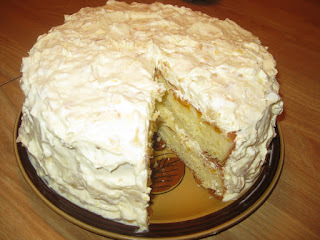 When cool, fill and frost with mixture of undrained pineapple and dry pudding mix stirred into the Cool Whip topping.